By Aisha Stacey : Is it just me or does the time seem to be passing more quickly lately. One minute it is 2010 the next we are in the final half of 2012. No matter how badly we want the time to slow down it just moves forward, one second, one minute, and one hour at a time. Days go by and it feels like minutes. Before the day’s work even starts it is night time. God mentions this phenomenon in various places throughout the Quran. Time passes swiftly, and when we stand before God on the Day of Judgement it will seem as if we have lived, dreamed and hoped for less than a day. It will seem as if we have worshipped our Creator for only the briefest of time and in only the most lackadaisical way. We know that many of us will beg God for more time, time to correct our actions and time to worship in a better way. Prophet Muhammad, may the mercy and blessings of God be upon him, reiterated this for us. Time will not slow down and we cannot go back to fix the mistakes we make therefore he advised us to take advantage of five, before five. We are advised to take advantage of what time we have. When we are young we take our youth and energy for granted. We feel as if we have all the time in the world, tomorrow, tomorrow, tomorrow. But tomorrow creeps up on us slowly and one of the first things we lose is our youth. A grey hair appears, there is a niggling pain in our back, or our shoulder or a knee. As old age approaches people find it harder to fulfil even their obligatory acts of worship. When it is impossible to bend our knees and put our head on the ground in submission, we want only to be able to go back and pray one extra prayer, fast one extra day the way we did when we were young and full of energy. The young must take advantage of their youth before old age strips it away. Boundless energy should be used to help others, and to collect as many rewards as possible. A believer must also take advantage of health before being overcome by sickness, with or without old age. Even young people are affected by ill health and injuries that make it impossible to worship in the way that they would like. Both God and Prophet Muhammad have emphasised the benefits and rewards that come from a believer experiencing pain and suffering. However when a person suffers ill health, he realises just how fragile human beings are. Prophet Muhammad reminds us that we do not know when our health will be taken from us. One day we have all our strength and mental faculties, the next we might be relying on others for even the simplest things. Wealth is another blessing that comes to us from God. A believer should give as much as possible in charity while there is still something to give. We tend to think of charity as money but it is not confined to monetary matters. We give with our hands, our time, our knowledge and our money. We even give with our smile. However, we should use our monetary wealth to worship and please God before it is taken from us. We have no way of knowing when God will see fit to remove our wealth from us. People are rich one day and homeless the next. We must spend our wealth for the sake of God before we do not have the means to do so. And this will not go unrewarded. Free time is another great blessing from God that each of us possesses, regardless of how busy we think we are. Spending this time wisely means not wasting it in fruitless activities that have no benefit. Even the simplest of acts can become worthwhile by simply doing them for the sake of God. If we free ourselves from fruitless time wasting activities it is possible the time to increase our religious deeds. When a person chooses wisely, worldly deeds can also be done for the sake of God. Remember that time moves inexorably forward. Do it today because you may not have a tomorrow. Use your free time wisely today before life is filled with worldly obligations that contain no benefit whatsoever unless you live every moment to please God. 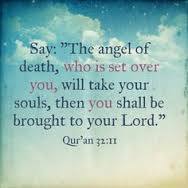 The final thing we have been advised to take advantage of is, life before death overtakes us. Every morning we should thank God for another day. Each day is a chance to do well; to spend in charity, to worship longer, harder, or in a better way. It is a chance to spread good cheer, smile, and pay that extra dollar or two in charity. It is a chance to perform countless random acts of kindness. We have become relaxed about the reality of death. At some point, perhaps in a matter of hours, minutes, or even seconds, our life will be taken away from us. Prophet Muhammad advises us to take advantage of the time we have. Do what you can now, not tomorrow, for tomorrow may never come.